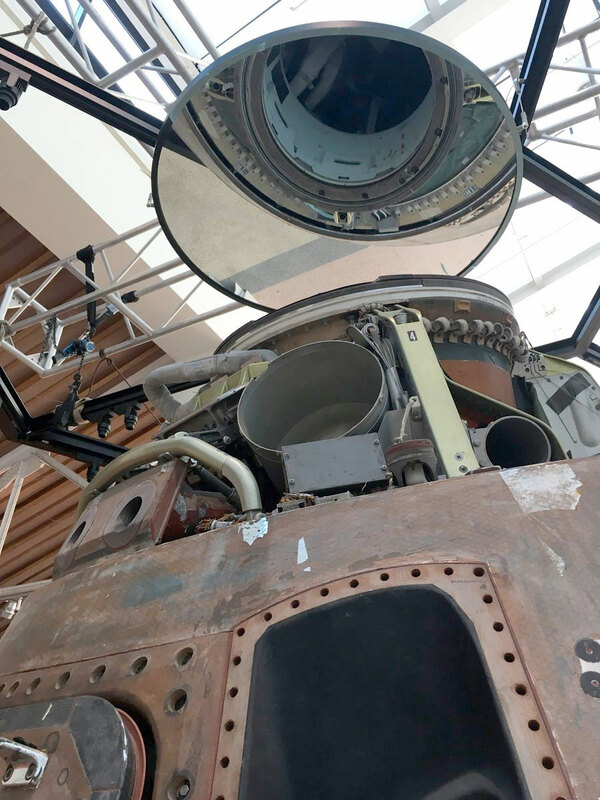 — NASA's last Apollo command module to launch into space has shed its skin to provide a better look at the capsule, which was the first United States spacecraft to fly a joint mission with Russia. 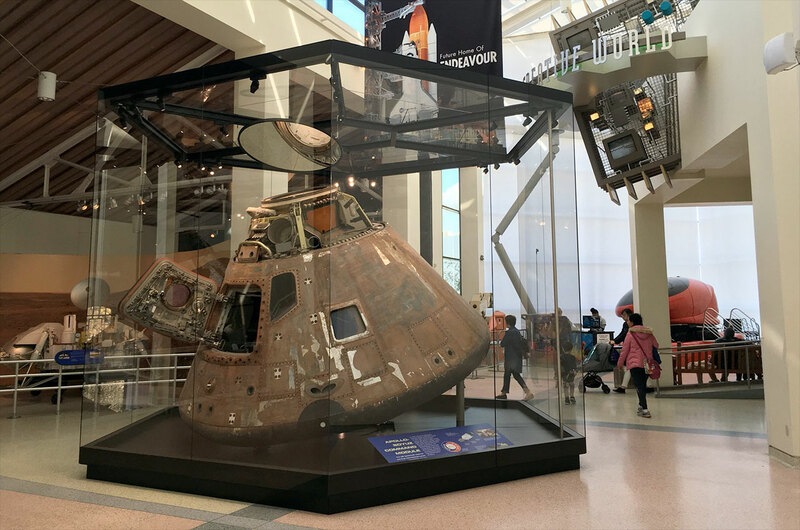 The American space vehicle that made up one half of the historic 1975 Apollo-Soyuz Test Project (ASTP) has traded its Plexiglas cover for a new glass display case at the California Science Center in Los Angeles. 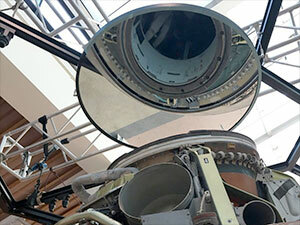 The six-sided enclosure not only affords the public a clearer view of the three-seat spacecraft, but also meets new conservation requirements set by the Smithsonian, which owns the artifact. 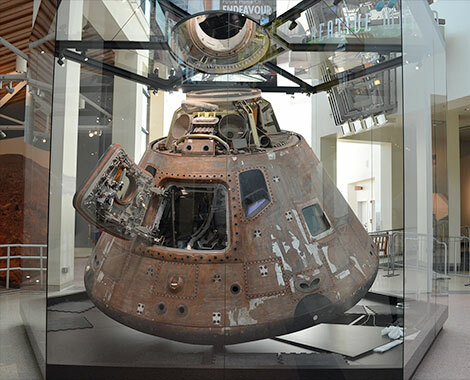 "The walls of the display case are made of laminated safety glass because glass has excellent visibility and will offer our guests a clear and unobstructed view of the ASTP command module," said Devin Waller, the exhibit's project manager at the California Science Center, in an interview with collectSPACE. "Unlike the softer acrylic case that was previously used, glass is more resistant to scratching and to chemical reactions that can damage the surface over time affecting the view of the artifact inside." The new case, created by New York-based Evidence Design and fabricated by the Germany-based company Glasbau Hahn, features interior lighting mounted to its ceiling and base frames providing illumination to see details on all sides of — and inside — the 43-year-old craft. 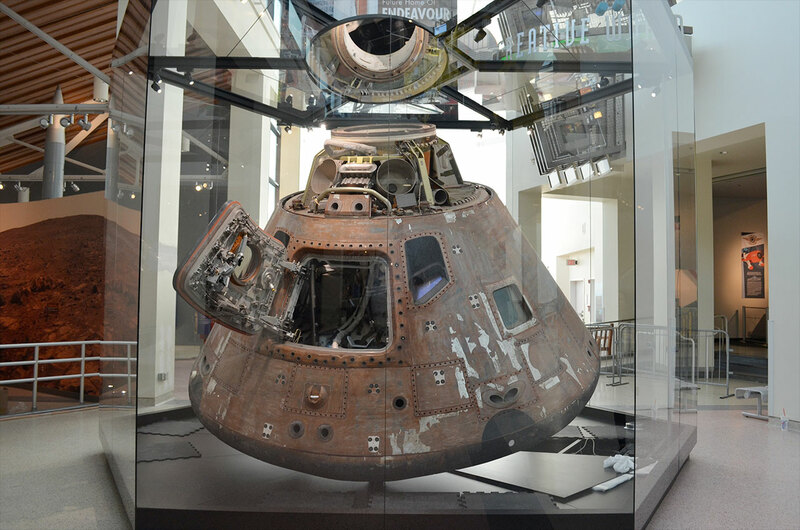 "The addition of a large mirror mounted to the ceiling of the display case will allow guests to see into the ASTP command module's docking hatch and tunnel, a view that was hard to see due to the configuration of the artifact on its display mount," said Waller. "Guests will now be able to view the internal crew compartment from another angle, namely the angle in which the Russian cosmonauts enjoyed seeing when transiting from their Soyuz spacecraft to the ASTP command module during mission operations." Originally slated to fly to the moon, command module no. 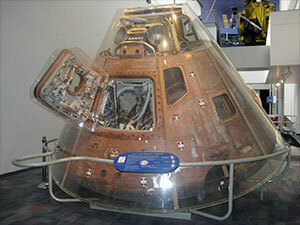 111 was reassigned to the Apollo-Soyuz Test Project when NASA's Apollo 18 lunar landing mission was cancelled. The spacecraft launched atop a Saturn IB rocket on July 15, 1975 with astronauts Thomas Stafford, Vance Brand and Donald "Deke" Slayton forming the American half of the mission. Two days later on July 17, the command module, outfitted with an adapter module, docked to the former Soviet Union's Soyuz 19 spacecraft with cosmonauts Alexei Leonov and Valery Kubasov on board. The two nations' crew members, previously competitors in a Cold War space race, exchanged handshakes and greetings in Earth orbit, setting the foundation for later cooperation on the International Space Station. 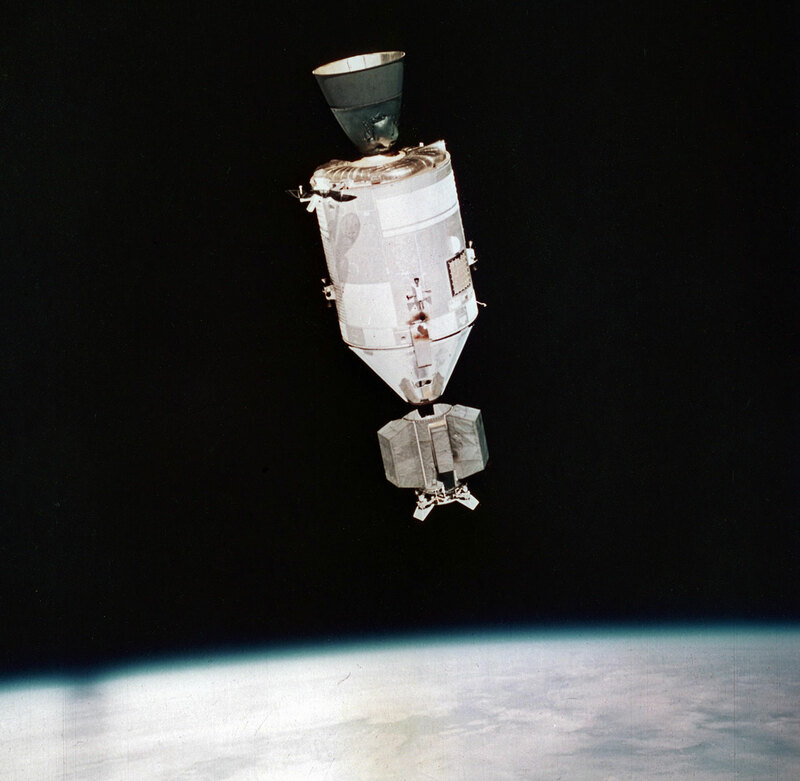 The ASTP spacecraft traveled a total of 3.7 million miles (5.9 million kilometers) while completing 148 orbits of Earth. it splashed down on July 24, 1975. The spacecraft debuted on display at the California Science Center, in a Plexiglas case, in 2005 after being on exhibit at NASA's Kennedy Space Center in Florida. This is the first upgrade to its showcase since arriving in Los Angeles. 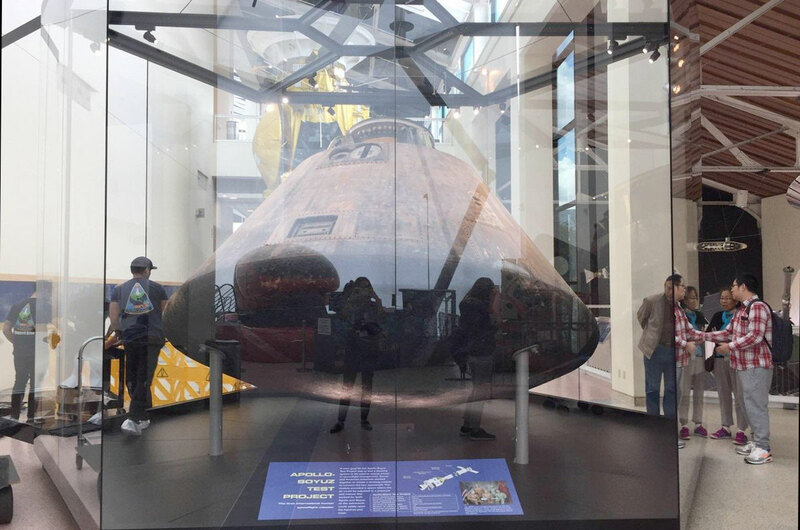 In addition to improving the experience for visitors to the science center, the new glass case is also better for the spacecraft's preservation. "Although we cannot control or prevent any emissions from the artifact, this case was manufactured and delivered using low emission construction and packaging materials," explained Waller. "A positive pressure environment inside of the case will keep dust from entering on the rare occasion when staff needs to enter the case for maintenance purposes." 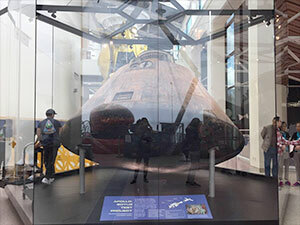 The science center is planning similar glass display cases for its exhibit of NASA's Mercury-Redstone 2 (MR-2) capsule, which launched the chimpanzee Ham, and the Gemini 11 spacecraft that was flown by astronauts Charles "Pete" Conrad and Richard Gordon. 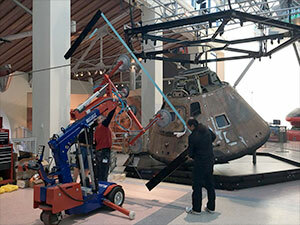 All three spacecraft will eventually be moved into the California Science Center's future Samuel Oschin Air and Space Center, which will also feature the display of the space shuttle Endeavour in a vertical launch configuration. 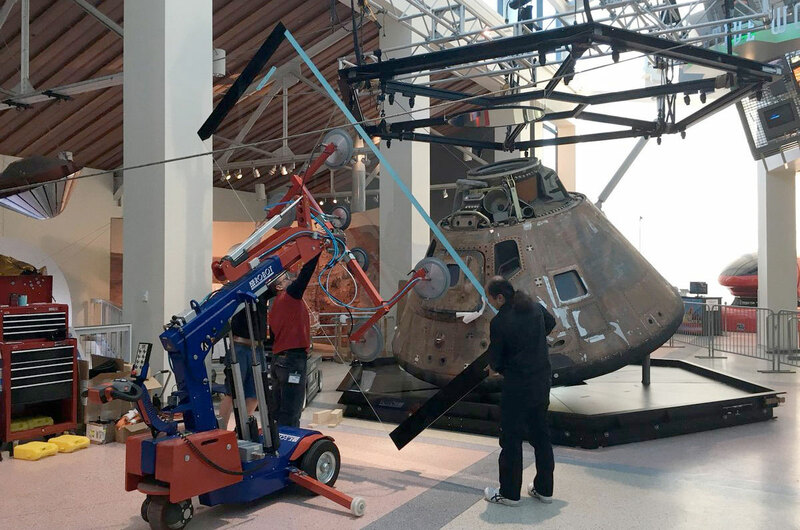 The installation of the ASTP command module's case began on Jan. 25 and was completed almost a month later on Thursday (Feb. 22). The work was done in full view of the public with updates shared online using the hashtag #apollouncovered.